Hampshire’s bowlers held their nerve to complete a nine runs win over Sussex Sharks at Hove and keep alive their hopes of reaching the knockout stages of the Royal London One-Day Cup - while ending Sussex’s dream. Chasing 269 to win, a fifth-wicket stand of 125 in 17.3 overs between Chris Nash and Ben Brown gave Sussex hope after they had been 109 for 4 from 29 of their 50 overs. But Brown was superbly caught by wicketkeeper Lewis McManus diving to his right after making a List A best of 62 from 56 balls (7 fours) midway through the 47th over. The 48th over began with 31 needed but Brad Wheal conceded just three runs from it and Sussex’s race was run when Chris Jordan, who had just driven the second ball of the 49th over for six over extra cover, was bowled off the next delivery by Ryan McLaren. Sussex required 17 from the final over but Wheal restricted them to seven runs as they finished on 259 for 6 with Nash undefeated on 68 from 74 balls (3 fours, 3 sixes). Hampshire had earlier been indebted to a stylish 92 from opener Jimmy Adams and some late-order hitting by South African all-rounder Ryan McLaren after they had been put in under overcast skies with the floodlights on from the start. Adams scored his runs from 97 balls with ten fours, and a six off Harry Finch in the same over that he reached his half century. The opener shared a second-wicket stand of 87 in 15.2 overs with Adam Wheater (42) who was superbly run out by Chris Jordan’s throw on the run from extra cover with only one stump to aim at. Hampshire struggled for momentum for a while after Wheater’s dismissal. Adams was fourth out in the 34th over, one of three victims for left-armer George Garton who surprised Adams with a bouncer which he could only touch to wicket keeper Ben Brown. Garton, fresh from taking four wickets for England Lions on Tuesday, bowled with good pace in three spells down the slope to finish with 3 for 40 and also pulled off a stunning catch at square leg to remove Tom Alsop. 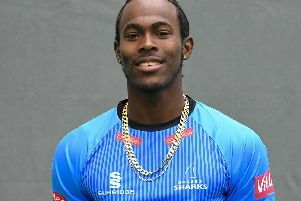 In the absence of Bangladesh left-armer Mustafizur Rahman, who is unlikely to play for the county again because of a shoulder injury, Jofra Archer impressed on his first List A appearance at Hove with 1 for 46, occasionally finding some steepling bounce on a good pitch. It needed some robust hitting from McLaren to get Hampshire to a competitive score. He made an unbeaten 46 from 39 balls from No.6 and those runs were to prove crucial. Sussex were 81 for 3 after 22 overs of their reply with Ed Joyce (16), Phil Salt (17) and Harry Finch (19) all unable to capitalise on starts but their chase was given impetus by Luke Wright, who made 45 from 60 balls. The Sussex skipper looked in the mood until he drove a full toss from Wheal to mid-on and departed mortified by his misjudgement. Brown and Nash took responsibility but fell short and a fifth defeat out of six has left Sussex with virtually no chance of reaching the knockout stages.